Health Information: Who’s Using A Cell Phone To Find It? Despite the proliferation of cell phones in the United States, the number of people using them to access health information is low. But experts believe the sheer number of people using mobile phones and wireless devices means that health information eventually will get more mobile as well. According to the study, 85 percent of Americans use mobile phones, but only 17 percent of cell phone owners have used them to look up health information. Nine percent of Americans have downloaded a health-related app on their cell phone. Get this: The highest use of cell phone health-information seeking and downloading cell phone health apps was among 18- to 29-year olds at 29 percent and 15 percent respectively. With the exception of accidents, 18- to 29-year-old adults are generally among the most healthy demographic. It’s hard to understand (perhaps with the exception of pregnancy and workout sites) why young adults would be spending time on their cell phones looking for health information. At that age they’re immortal, for God’s sake. 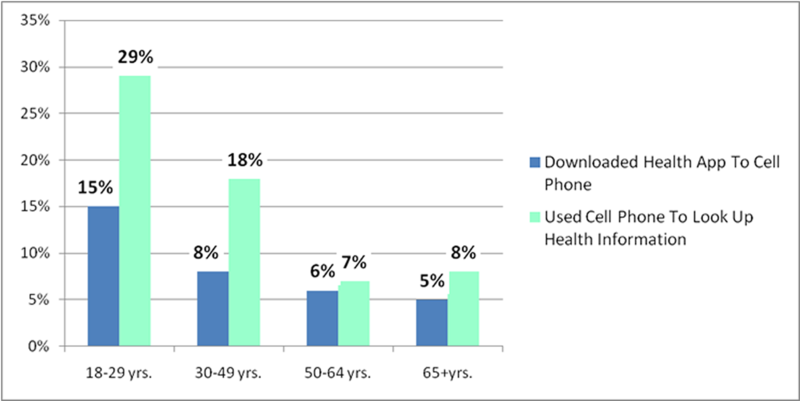 It’s really surprising that so few older adults 50+, half of whom have at least one chronic condition, are the least likely to use their cell phone (if they have a smartphone) to seek health information or download health apps (at 6 percent and 8 percent respectively). First of all, who among us over 45 can read the darn screen on their phone without glasses? And have you ever tried putting on glasses while trying to enter text using the phone’s tiny key pad? It’s not a pretty sight, not to mention that most people this age still look to their own physician as the most trusted source of health information. So before all you healthcare marketers try to persuade your physician and hospital clients to invest in mobile health management apps or SMS text-based health management programs, consider this simple fact: Unless you want to talk to healthy young adults (okay, one day they will get old), the people you need and want to reach don’t seem to be very interested. But just wait 20 years, as all of today’s 18- to 29-year olds start to turn 50, and you just may have a market.